After York dominated Gray-New Gloucester in the quarterfinals, there was a general consensus that Greely would pose a tougher challenge. That general consensus proved to be wrong, as York eased past another opponent, blowing past Greely for a 46-15 win. Greely looked like a worthy opponent in the game's first eight minutes. After Caroline Hamilton hit a 3-pointer to open the scoring, York went on a 9-2 run. Chelsey Morley and Steph Gallagher each had 4 points a piece in the quarter. Greely would claw back, with Sara Warnock getting two baskets late, as it was a 13-9 York lead at the end of the first quarter. It was then that York took over. York would go on a 12-0 run in the quarter, as Greely offense laid dormant. 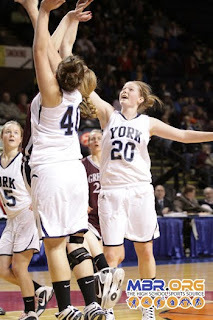 Gallagher would push her point total to 9 in the half as York pulled away. The Rangers would fail to score in the quarter as they went into halftime down 25-9. The second half didn't get much better for Greely. York had 5 players score in the third quarter as they pushed their lead even further. Two Warnock free throws would end the Ranger scoreless drought with 2:30 to go in the quarter. It was a 38-13 Wildcat lead heading into the fourth quarter. Chelsea Bridges would score the only field goal for Greely of the final three quarters as York put in the bench at the end. Gallagher was named the Capt'n Eli's Soda Player of the Game after pacing the Wildcats with 11 points and helping York pull away in the second quarter. York moves on to the Western Maine Final, where they will face Leavitt. Something will have to give as both teams are undefeated heading into Saturday's match-up.